This was serious navigation. Pádraig’s wheelchair is, like himself, a little longer than average as it is. Today, he was ok to try out a wheelchair trolley in the supermarket where we did our weekly shopping. The trolley attached to the front of the wheelchair doubling its length and increasing the weight of what had to be pushed as we were passing shelves and fridges, working our way through our weekly shopping list. There’s loads of stuff Pádraig has been doing for the first time again over the past months and years as he has been recovering from his injuries. 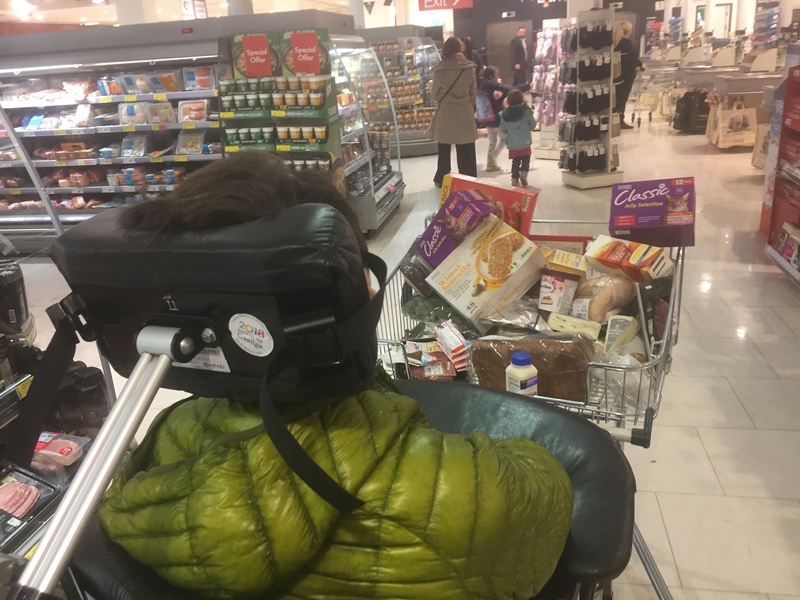 Today’s tour d’supermarché was a first for me – most definitely something I would not have done in the early days after Pádraig’s discharge home when I had problems pushing the wheelchair on the footpaths, never mind in supermarkets. Now, as today showed us, now we are a great team working together on all sorts of daily chores. Who would have thought, we’d be doing stuff like that together, trying out new gadgets together, sharing the weight?